Providing you the best range of industrial mounting press machine, mounting press machine and specimen mounting press machine with effective & timely delivery. For each specimen mounting, 8-10 minutes is enough and a mirror -like specimen can be acquired. 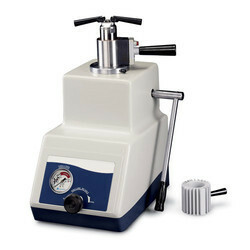 For permanent mounting of metallographic or rock specimen in thermostatic Plastic. The unit is of a rugged construction and is activated by an hydraulic press, capacity 6 -8 ton. 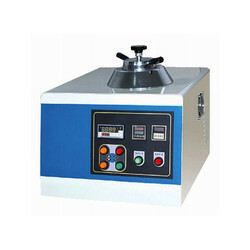 The press is supplied complete with mould heater and sensor. As a standard outfit 25/40 mm dia mould assembly is supplied along with the machine. The temperature is controlled with Digital controller. Timer facility is given within the panel. 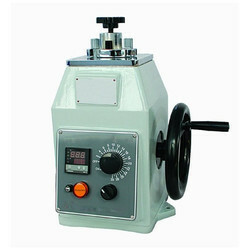 Mounting Press Machine with digital control panel this machine is good working and easy sample and alarm timer knob main line indicator signal face supply hydraulic jack MS sheet frame MS road piller iron plating complete machine diameter size 3 x 2.5 inches. Looking for Industrial Press Machine ?